Hello all! Thank you for having me. I’m a Northern Californian Ranch Hand with specific engineering in First Order needs. I’m here to learn and assist in builds, and soon to own professional First Order armor. I’ve assisted TK-42134 with some though build challenges, including correctly sizing his armor to his larger frame. I’ve also designed a universal helmet cooling system for those wanting pinpoint comfort. Upon approval of Administration I’ll share the details to my helmet fan. I’m also on a mission to meet with a few Stormtroopers and Boba Fett I met at a Stockton Ca Symphony. To these fine gentlemen/gentlewoman, I own a great thank you. Hi David and welcome to the FISD! First, it really helps to fill out all the information in your profile, including where you are located (city/country). The reason being is that someone in the UK may not want to pay for shipping/customs to the U.S., and vice-versa. You will also need to list the complete cost including shipping, PayPal fees, etc. ("out the door" price) to potential buyers, as well as detailed photos/info. of the item, and let them know if you do offer shipping outside your country (including postage rates). I would factor in to your price the use of PayPal's "Goods and Services" option, and highly suggest that you encourage people to use it. It shows that you are an above board seller which will encourage them to purchase. Being a new member can be daunting when starting a sales thread. I'm sure you are above-board and have a great product, but until people get to know you and you have a proven track record it can be difficult. I assume that you will be offering your item(s) on an ongoing basis, and as long as you follow the rules in that forum (https://www.whitearmor.net/forum/forum/16-ongoing-sales-project-orders/) there will be no issues. We are always welcoming of new stuff, so once you get your name and reputation established you should do well. All the best on your venture!!! Welcome to the FISD David. Here you'll find the largest collection of FOTK build threads and support. As Joseph mentioned the sales thread is open to all members and we already have a couple helmet cooling system suppliers there but you are more than welcome to add to the list. If there's anything you need feel free to hit up anyone of the staff or knowledgeable members. Hello and welcome to the FISD! Think Joseph's got you covered for the sales part. 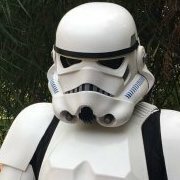 This is the true home of the First Order TK's, you will find all the information you need right here, including one of the most comprehensive build threads you will ever find on a FOTK. Welcome aboard David! Great to have you here and hope you join the ranks with that FOTK. It’s a great group here and I’m sure you’ll be a fine addition to our troopers! Hello and welcome, fellow Californian!